Definition at line 165 of file zip.c. Definition at line 174 of file zip.c. Referenced by LoadCentralDirectoryRecord(), Write_EndOfCentralDirectoryRecord(), Write_Zip64EndOfCentralDirectoryLocator(), Write_Zip64EndOfCentralDirectoryRecord(), zipClose(), zipOpen3(), and zipOpenNewFileInZip4_64(). Definition at line 173 of file zip.c. Referenced by LoadCentralDirectoryRecord(), and zipOpen3(). Definition at line 169 of file zip.c. Referenced by LoadCentralDirectoryRecord(), zipClose(), zipCloseFileInZipRaw64(), and zipOpen3(). Definition at line 171 of file zip.c. Referenced by Write_LocalFileHeader(), zip64FlushWriteBuffer(), zipCloseFileInZipRaw64(), zipOpen3(), zipOpenNewFileInZip4_64(), and zipWriteInFileInZip(). Definition at line 168 of file zip.c. 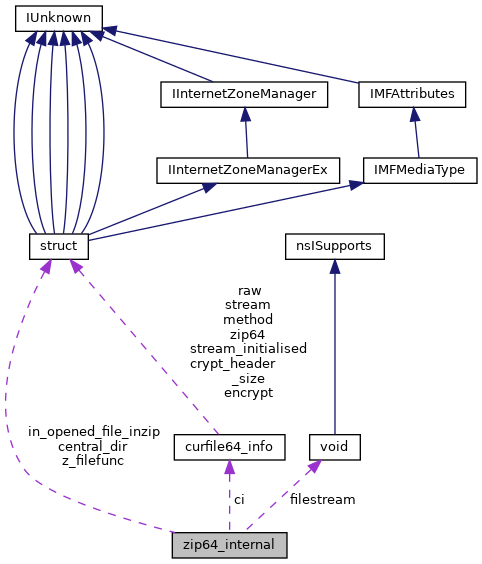 Referenced by LoadCentralDirectoryRecord(), Write_EndOfCentralDirectoryRecord(), Write_GlobalComment(), Write_LocalFileHeader(), Write_Zip64EndOfCentralDirectoryLocator(), Write_Zip64EndOfCentralDirectoryRecord(), zip64FlushWriteBuffer(), zipClose(), zipCloseFileInZipRaw64(), zipOpen3(), and zipOpenNewFileInZip4_64(). Definition at line 178 of file zip.c. Referenced by LoadCentralDirectoryRecord(), zipClose(), and zipOpen3(). Definition at line 170 of file zip.c. Referenced by zipClose(), zipCloseFileInZipRaw64(), zipOpen3(), zipOpenNewFileInZip4_64(), and zipWriteInFileInZip(). Definition at line 175 of file zip.c. Referenced by LoadCentralDirectoryRecord(), Write_EndOfCentralDirectoryRecord(), Write_Zip64EndOfCentralDirectoryRecord(), zipClose(), zipCloseFileInZipRaw64(), and zipOpen3(). Definition at line 167 of file zip.c.